"Hmmph...looks like you've already wallowed in all the dirt--not to mention zombie crap, Wynonna." Wyatt Earp's name carries plenty with it, mostly in the way of law enforcement and general legendary status. It only makes sense that the character's name would carry down a lineage and that's what it does in Wynonna Earp #1 from IDW Publishing. The issue is written by Beau Smith, illustrated by Lora Innes, colored by Jay Fotos and lettered by Robbie Robbins. The US Marshals Black Badge division has been fighting back against supernatural threats for decades. But even the toughest werewolf, most bloodthirsty vampire, or grisliest zombie knows there’s one agent to avoid at all cost: Wynonna Earp. Descended from the legendary Wyatt Earp, Wynonna is dead set on bringing the unnatural to justice! 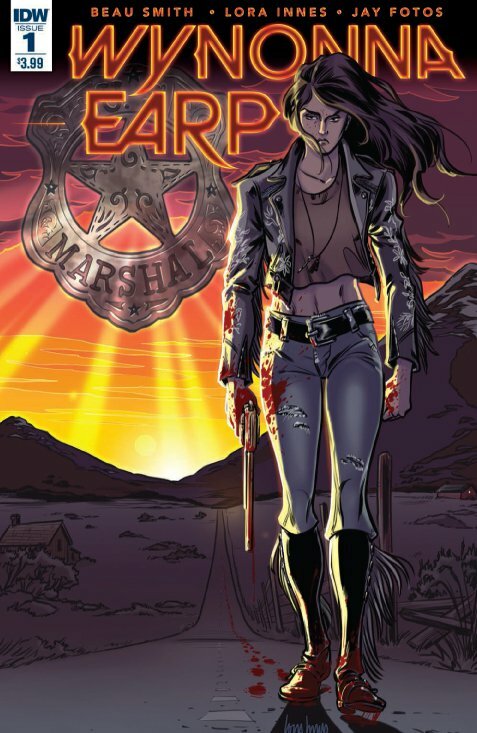 Wynonna Earp #1 doesn't shy away from its distinction in being a supernatural investigation story. Smith's Earp is calm, cool and collected and doesn't hesitate to let anyone or anything get in her way of the investigation. Much of the dialogue in the issue is tinged with a gritty sarcasm, providing an atmosphere befitting of a female monster hunter. And Smith goes to great lengths to bolster Wynonna Earp's credentials, successfully blending together her lineage in the Wyatt Earp line with an almost brash recklessness and disregard for authority. There's a heady mix of characters introduced to the reader as well that helps to flesh out the world around Earp, providing plenty of characters for her to contrast (and conflict) with. The artistic approach in Wynonna Earp #1 is pretty interesting as Innes relies on a fairly gritty style. That grittiness lends itself to being very graphic and violent at points, with opponents literally exploding on page. Many of the other characters have a look to them that's fairly simplistic and Innes doesn't really focus too much on backgrounds. Wynonna herself comes across as confident and capable, evoking images of Krysten Ritter's most recent portrayal of Jessica Jones in appearance and stature. Fotos does a good job on colors, ensuring that the gore is accentuated by reds and the setting bears a western flair through yellows and browns. Wynonna Earp #1 is essentially aligning things for the upcoming show, but it does a good job of doing so. Wynonna Earp is presented in a way that sets a fast pace for the series. Smith knows the character very well and effortlessly gives her plenty of great traits that will get her by. Innes' illustrations are efficient at presenting the action to the reader, blending together plenty of different character types. Wynonna Earp #1 is a solid first issue that sets a very strong tone for the remainder of the series. Wynonna Earp #1 is in stores now.